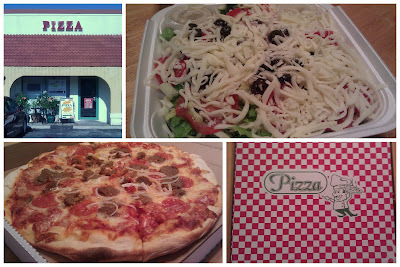 The Pizza Files: Picasso's Pizza June 2011. The Binge 2011 stop 6. Picasso's Pizza June 2011. The Binge 2011 stop 6. A favorite, but I just can't seem to find my way there very often. The family out of town and working just down the street, I couldn't help myself. A House salad with the house dressing and a large pizza with pepperoni, meat balls and onions. More than enough to feed my self and a second pizza eater. We had enough left that two more pizza eaters would have gotton their fill, and only a shade over $20. Plus the pizza and salad was great! You know, until I started looking at these posts I never realized there was such a varied pizza world. Why do they call this Picasso? Do you need to wear a painter's smock becauce the pizza is so messy? Or is it because the pizza is a work of art? I'm not sure why they are called Picasso, but I can tell you that when I make a pizza it is a Work of Art. JJ Twigs July 2011. Binge 2011 stop 8. Little Caesars July 2011. The Binge 2011 stop 7. Red-L Pizza June 2011. The Binge 2011 stop 5. Talayna's Pizzeria June, 2011. Binge 2011 stop 3.